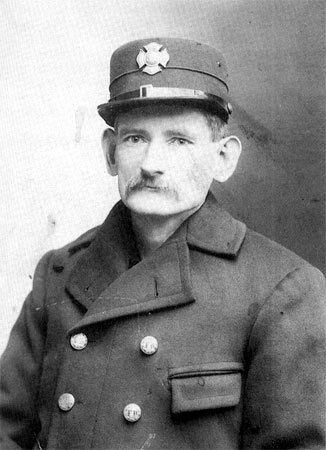 JAMES McDADE was born in Pennsylvania in September of 1860. He had come to Camden by 1884. His wife, the former Emma Ferkler, was seven years his senior. She gave birth to a son, James Jr. in October of 1886, another boy, Joseph, was born in May of 1887, a daughter, Emma, in March of 1892. The family lived at 7 James Court during these years. James Court was a small street that ran east from Point Street, between Pearl and Birch Streets, and was erased when the Delaware River Bridge was built in the early 1920s. James McDade worked as a spinner at the Boyer & Shimer worsted mill. By 1900 the family had moved to 8 Pearl Street. 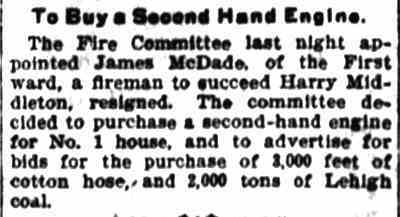 By 1906 James McDade had been appointed to the Camden Fire Department. He made his home at 608 Point Street when the 1906 City Directory was compiled. Oldest son James Jr. had by then gone to work as a moulder in a nearby iron foundry. The family remained on Point Street through at least 1910. 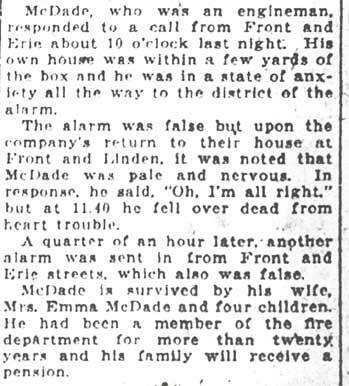 A 1913 news article has the McDades at 415 North Front Street. 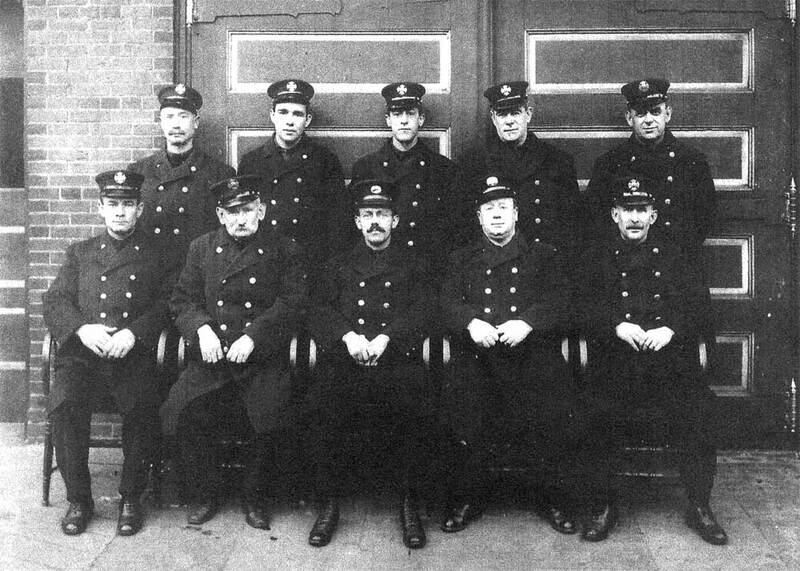 By 1914 James McDade had moved to 414 North Front Street. Both McDade sons had married by 1914, Joseph, a plumber, and his wife Mamie having moved to 408 Mickle Street. James Jr. and his wife Nellie got their own home at 413 Cedar Street by September of 1918. Emma McDade married Stanley R. Wirtz, a co-worker of brother James Jr., on January 1, 1912. The Wirtz family lived with McDades at 414 and 412 North Front Street at different times over the next 10 years. The 1920 Census shows that James and Emma McDade were renting a home at 329 Cole Street, a street no longer in existence that ran between Penn and Linden Streets. 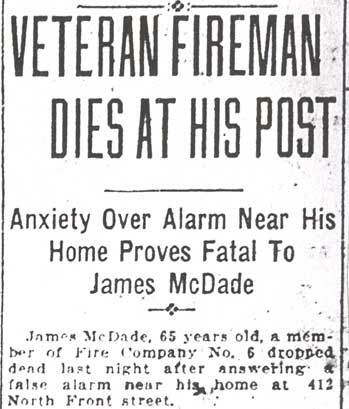 James McDade was still working for the Fire Department, as an engineer. A grandson, Earl Bowker, lived with them. They later moved to 412 North Front Street. 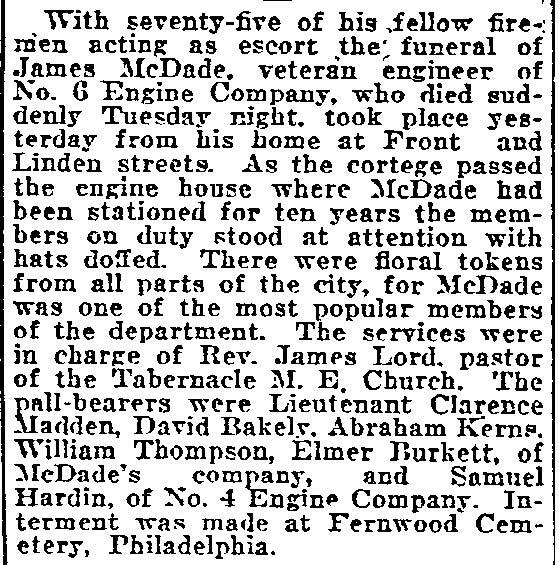 While serving with Engine Company 6 on July 5, 1922 James McDade died in the line of duty, suffering a fatal heart attack after responding to a false alarm near his home. As stated above, James McDade's daughter Emma married Stanley Wirtz on January 1, 1912. He went on to serve for many years with the Camden Police Department. Their son Edwin S. Wirtz served with the Camden Fire Department for 22 years, retiring in 1965. 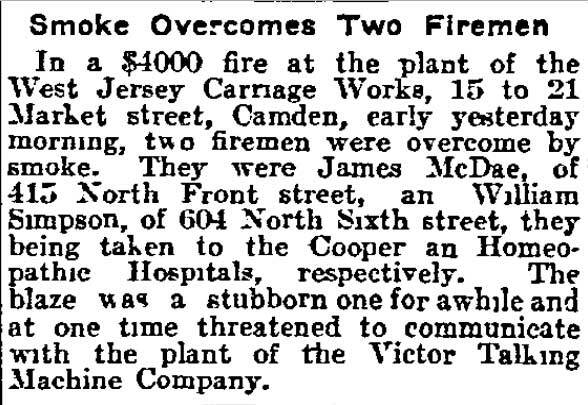 Edwin's cousin Carl Wirtz also served as a Camden firemen, for 12 years, ending in 1963.